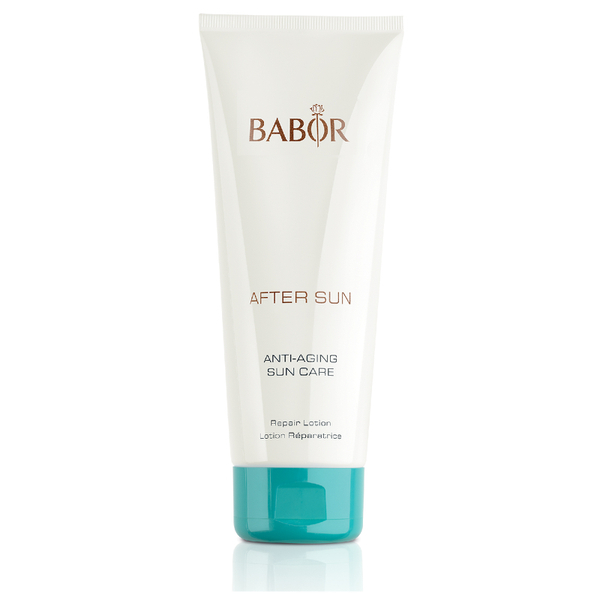 Soothe redness and inflammation with the BABOR Aftersun Repair Lotion. Delivering instant relief from sunburn and irritation, the lightweight lotion contains an active complex of Cardiospermum, Echium and Sunflower extracts, which work in harmony to alleviate feelings of tightness and discomfort while helping to encourage skin repair and regeneration. The addition of Monk’s Pepper and Acetyl Tyrosine stimulate melanin synthesis, resulting in a prolonged and more even looking tan. Apply After Sun Lotion generously to calm stressed skin after sun exposure. Aqua, Glycerin, Butyrospermum Parkii Butter, Dicaprylyl Carbonate, Persea Gratissima Oil, Octyldodecanol, Squalane, Cetearyl Alcohol, Hydrogenated Vegetable Glycerides, Vitex Agnus Castus Extract, Potassium Cetyl Phosphate, Tocopheryl Acetate, Phenoxyethanol, Alcohol, Parfum, Panthenol, Hydrogenated Palm Glycerides, Carbomer, Acetyl Tyrosine, Xanthan Gum, Echium Plantagineum Seed Oil, Ethylhexylglycerin, Helianthus Annuus Seed Oil Unsaponifiables, Sodium Hydroxide, Potassium Sorbate, Disodium Edta, Biosaccharide Gum-1, Caprylic/Capric Triglyceride, Cardiospermum Halicacabum Flower/Leaf/Vine Extract, Pantolactone, Ascorbyl Palmitate, Citric Acid, Tocopherol, Ascorbic Acid.